All things peplum are hot for fall, so for this week’s Fabulous Find, we found a chic peplum top from the place to go for trendy and budget-friendly pieces: Forever 21. The top comes in a rich red hue that’s perfect for fall, while the material has a luxe, almost quilted texture. This is the type of top that can work for every occasion, whether you’re headed to classes or an internship or even to a formal soiree. The best part? You can snag this gorgeous top for under $15 — talk about bang for your buck! For the first look, we wanted to play up the textured material of the top by pairing it with some gorgeous lace shorts. Sheer tights add an extra layer of warmth and a stylish touch. A trendy silver collar necklace gives the outfit an extra dose of glamour, while a black cross-body bag is both practical and chic. This outfit would be a fashion-forward look for a dinner date or other similar occasion. To make this peplum top work for daytime, the most obvious choice is to pair it with skinny jeans. However, instead of your basic blue skinnies, we decided to go with a trendy pair of plum-colored jeans, which create an almost monochromatic look when paired with the red blouse. Cozy ankle booties keep the look casual while a trendy leopard print backpack makes the outfit perfect for class. For the finishing touch, accessorize with a menswear-inspired watch and sparkling stud earrings. Our final look is the dressiest of the bunch, making it a great ensemble for a formal occasion. Start by paring the blouse with a sleek black pencil skirt, which really accentuates that peplum silhouette. A snake print belt helps create an hourglass shape, while pointy-toe pumps elongate the legs. Accessorize with a white box clutch and red stone ring for a dressy and on-trend look. What do you think of this week’s Fabulous Find? 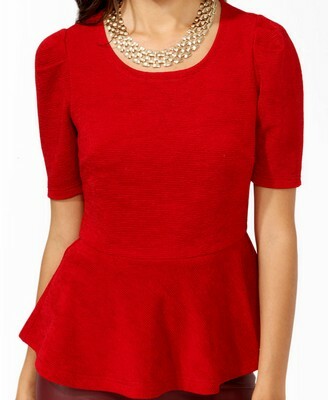 Would you buy this peplum top from Forever 21? Which look is your favorite? How would you wear the top? Remember to leave a comment below and tell us what you think!